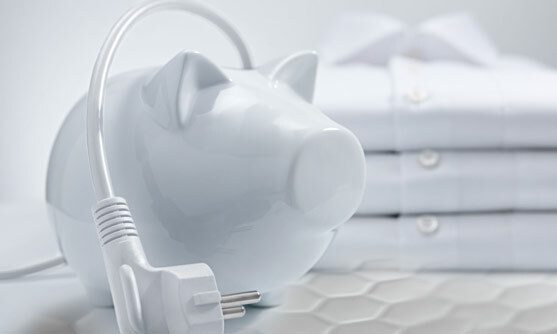 Savings for the life of your tumble dryer The filter system and the maintenance-free heat exchanger keep energy consumption and run time low. The EcoDry technology consists of a perfectly coordinated filter system and the maintenance-free heat exchanger. This system ensures that no fluff is deposited in the heat exchanger. In systems without EcoDry, the heat exchanger may clog over time and lead to steadily increasing energy consumption and drying times over the life of the tumble dryer. Short cycle times, low energy consumption. 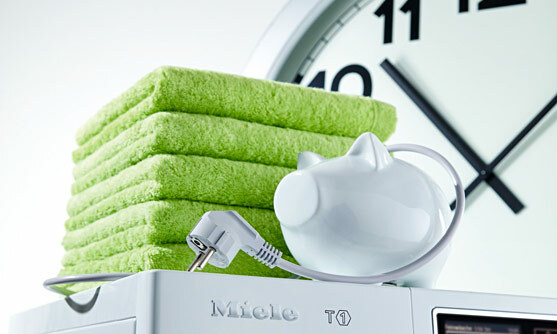 Miele's EcoDry technology guarantees short drying times throughout the entire life of the appliance. In systems without EcoDry technology the heat exchanger may clog with fluff over the course of time. This leads to less warm air being available in the drum interior to absorb the moisture of the laundry. This results in longer running times until the desired drying results are achieved. Freshness for all the senses: with Miele you not only have very bouncy, but also beautifully fragrant laundry. With your Miele tumble dryer you can now enjoy the superb convenience of a long-lasting and well-balanced fragrance. The new Miele fragrance flacons envelop your laundry with fragrance during drying. As a result, you get not only particularly soft laundry, but also laundry that smells great. Select your favourite from five different fragrances. The fragrance flacon1 is simply fitted into a holder on the easily accessible fluff filter and distributes an unobtrusive fragrance evenly onto your laundry. The intensity of the fragrance can be adjusted by turning the flacon. For the ultimate freshness experience in every drying cycle! Always perfectly dried: Perfect Dry detects the calcium content of your water and adjusts the programme duration. 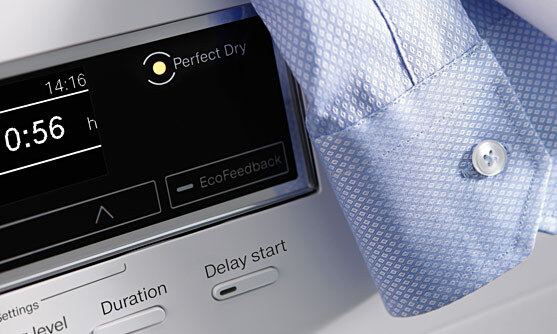 Perfect drying results thanks to mineral sensors: with the PerfectDry System, your laundry is dried "precisely", even if the water in your catchment area is very hard. This is by no means the norm on tumble dryers. Calcium in the water influences residual moisture sensing, which in turn has an impact on drying results. With PerfectDry, mineral sensors record the amount of calcium in the water and adjust the drying process for precise results. This ensures that your laundry is not too dry or too wet. The selected drying stage is always achieved. Best performance A+++: Highly economical and best results. Economical and environmentally friendly drying Tumble dryers can be environmentally friendly: Miele heat pump tumble dryers achieve an A++ energy efficiency rating with ease. Appliances with the highly efficient Miele ProfiEco motor and a regulated compressor work even more economically and actually achieve an A+++ energy efficiency rating. This saves money and you have the advantage of drying laundry with a clear conscience. 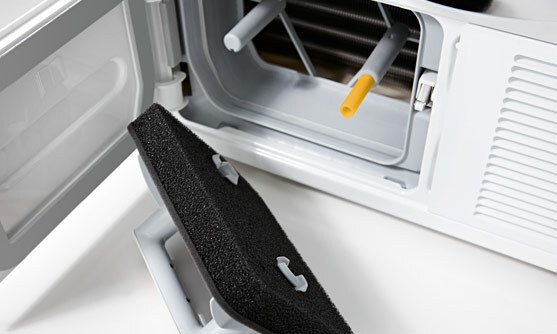 Well protected: A filter protects the heat exchanger so it no longer requires cleaning. Reliable down to the last detail In Miele heat-pump dryers, the heat exchanger is protected by an effective filtration system and does not require cleaning. 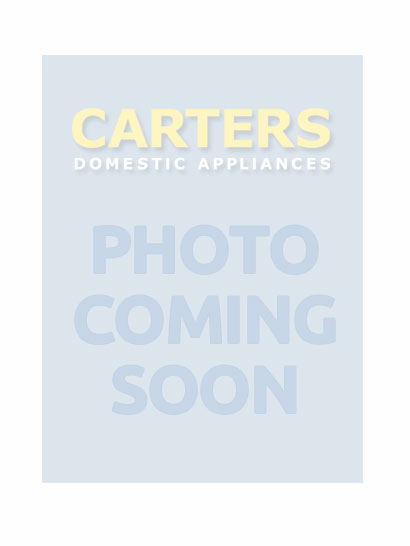 This ensures that energy consumption stays low continually for the complete service life of the appliance.